Next time you decide not to take off your shoes when walking into your house, think twice. According to several researches, the variety and number of bacteria your nifty shoes can carry are astonishing. Many of these germs are really dangerous, as they are capable of landing you in the hospital with pneumonia, urinary infections and other diseases. There are other dangers, too! How many places do you visit daily? Perhaps, you go to class, go shopping, grab a couple of burgers at the local café, and then head back to your home. When you approach your front door, a voice in your head is likely to advise: “Why bother taking off shoes if I did not step into anything disgusting?” And then you go in without leaving your portable Petri dishes at the door. The truth is, even if you do not spend days in hospitals, the bottoms of your shoes become home to myriads of germs which use them as a means of transportation. It has been revealed that among the strains which can be found on shoes of an average American are E. coli, Klebsiella, Serratia ficaria and Clostridium difficile. All of these are capable of making you seriously ill. E. coli can cause diarrhea, intestinal infections and meningitis (the latter is rare and seen in newborn babies). Klebsiella can result in pneumonia, meningitis, urinary tract infections and other diseases; Serratia is infamous for nosocomial infections. Clostridium difficile is one of the most dangerous germs of all germ kinds: it causes severe diarrhea which can turn into colon inflammation and other serious and even life-threatening conditions. It is difficult to treat with currently available antibiotics. Four out of ten have these on their shoes. An average shoe harbors about 440,000 bacteria. By the way, shoe bottoms are even more populated than toilet seats! 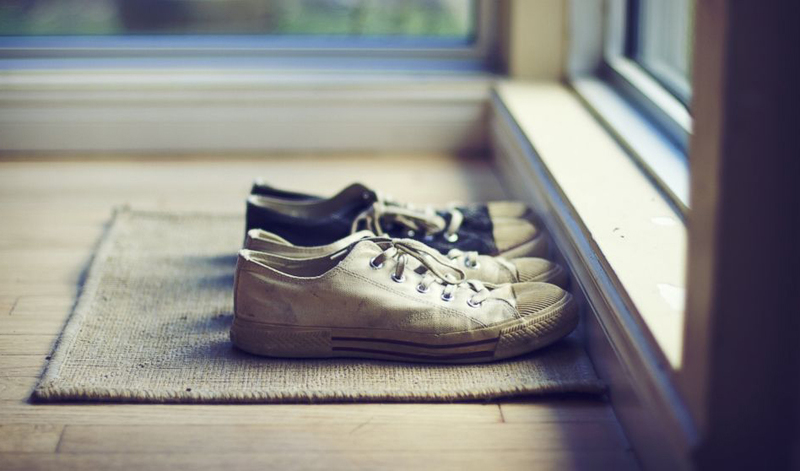 However, bacteria are not the only thing you can bring home on your shoes. One more threat is toxins. If you think that avoiding walking in chemical plant areas can help you prevent toxins from getting to your shoes bottoms, you are wrong. One of the most common ways for toxins to enter your house is your lawn. Remember that liquid you used a couple of weeks ago to get rid of the weeds? Say hello to its particles in your room. The same is true of some asphalt road materials. Even rain water can be contaminated, as it’s full of chemicals, gasoline and other substances (as well as bacteria), and by walking along the street on a rainy day, you can get even more passengers to transfer home. Besides the aesthetic aspect of bringing dirt home, it is worthy of note that dirt is a perfect substance for bacteria to multiply in. The optimal conditions for growing are not the only thing which makes it a good place for bacteria to stay: decaying matter is good food for them, so it is one more reason for them to travel by mud. Also, it’s just not that beautiful if brown puddles are all over the place. It is especially important to keep the area clean and take off shoes before entering the main living area, if you have a child. Toddlers crawl a lot and put things in their mouth, thus making it easier for germs to enter their bodies. It is recommended that everyone should wash their shoes with a detergent: such an approach can help kill the majority of bacteria. After washing, you can use a special device which uses ultraviolet to kill fungi and bacteria inside shoes and let them dry. Such devices are called ultraviolet shoe sanitizers and may come in handy if you want to keep your house or apartment clean: they do not consume much energy and are easy to use.